Very good condition and mostly original. Recent improvements include replaced lower bulkheads, replaced portion of cockpit sole, replaced rudder pintles and upper gudgeon, replaced compass, rewired navigation lights with new LED lights, installed rudder lock bar. 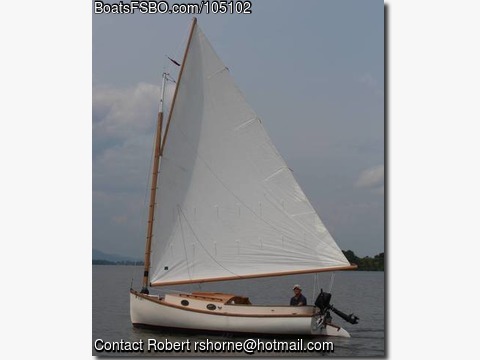 Gear includes original mast and new mast with Marshall tabernacle (folding mast), 2013 Load Rite trailer with less than 500 miles, 2012 Tohatsu 6 hp 4 cycle outboard with less that 25 hrs, 3 gal fuel tank, sail new in 2011, mini deep cycle 12 v battery, bunk cushions, Danforth anchor with deck mount, 3 boom crutches (short, tall, travel w/ mast slot), custom mast lifting tool, custom mast raising rig that fits on trailer, bumper, running rigging. Asking: $13900 (boat-$7500; tabernacle mast-$2800; trailer-$2800; motor-$800).